Using colorful beads to make beaded leather jewelry can be a fun project for any crafter. Leather cuff beading is a versatile technique that can be used to create attractive handmade jewelry. When most people think of leather cuff beading, they think of the intricate designs featured on Native American jewelry. In Native American cultures, beaded jewelry has been used to show connection to a particular group or as part of ritual ceremonies. In some cases, beads were even used as a form of currency. The beads used on Native American bracelets were traditionally made from turquoise, amber, ivory, shells, animal bones, or teeth. 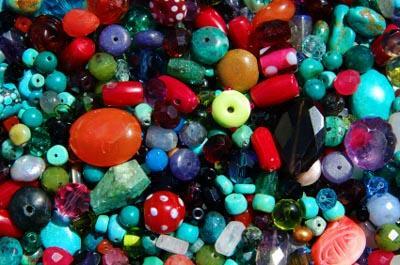 However, glass beads were later introduced into Native American beadwork by European travelers. As a tough, durable, and readily-available material, leather seems like a natural choice for Native American jewelry. Of course, the same skills used to create beaded leather jewelry can be used to decorate moccasins and leather clothing items. Overlay Stitch: A stitch done with two threaded needs and used to cover a large area with beads. Lane Stitching: A technique that uses "lanes" of beads to create regular rows. Transmontane or Crow Stitch: A special type of lane stitch in which different elements of the pattern are beaded as distinctly separate units joined by an outline composed of a single row of beads. Woven or Loom Work: Beaded designs created by using small seed beads and a loom. A detailed explanation of the bead weaving techniques used in creating Native American jewelry can be found on the Native Tech website. You can make a "knotless" knot by making three stitches perpendicular to each other in the same place. You can hide knots by placing them in the path of the covering beadwork. If you've added too many beads to your design, use a pair of pliers to squeeze and snap the bead. This eliminates the need to take out stitches, but you'll want to wear appropriate eye protection in case the beads pieces scatter. Rubbing candle wax along your thread reduces fraying and tearing during the beadwork process.